This is an enjoyable movie and rightly billed as Rocky for a new generation. I must say the music, and cinematography people will instantly recognise the Rocky references, even without being told that this is being billed as Rocky for a new generation. 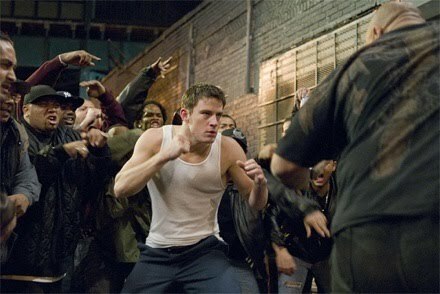 It stars Channing Tatum(Step up to the streets) as a former college wrestler Shawn McArthur struggling hard to make ends meet in New York after having an altercation with his father/coach of the wrestling team. We meet him as he is struggling to offload a series of books he has no idea are counterfeit, one of the hapless buyers happens to be the gorgeous Zulay Valez (Zulay Henao, S. Darko something about her just reminds me of a cat), from the altercation that occurs with Harvey Boarden(Terrence Howard, Iron man) and some of his associates, Harvey gets the impression Shawn may indeed be just what he is looking for, for an underground fighting campaign, the rates of pay of course are several times more than either of them could make struggling to survive on the unforgiving metropolis that is New York. Although billed as Rocky for the next generation, there are some testing questions the original Rocky would not have crossed his mind to contemplate, and of course there is the familiar territory of the arch nemesis of a protagonist, the talented wrestler Evan Hailey(Brian J. White The Shield) who happens to have been the catalyst for the original fallout with Shawn’s father, as equally Harvey as Shawn’s unofficial manager has to face some of the taunts from his comrades who are rolling in the money, notably Martinez(Luiz Guzman, Traffic) Jack Dancing(Roger Guenver Smith, He got game). You are left wondering if Shawn is going to make it as a underground fighter, and if there is any romantic hope for him and the lovely Zulay equally struggling herself to raise a child on her own, and her troubling grandmother. It is a enjoyable movie, and I for one hope there is a sequel.